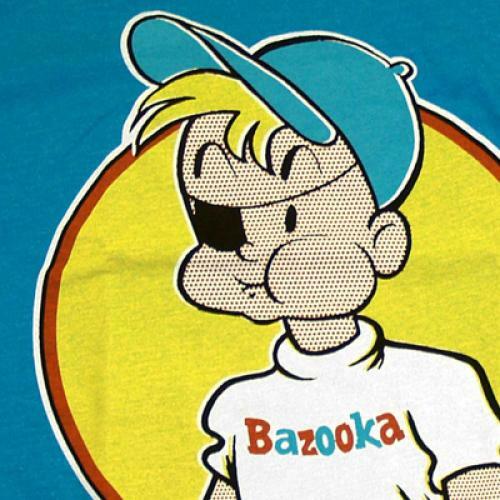 But weep not for Bazooka Joe, that fondly remembered, tow-headed, eye-patched, ball-capped, ordnance-named mascot. He and his pal Mort—the one whose turtleneck is so tall, it’s technically a turtlechin—aren’t going away, exactly. They’ll still get featured occasionally in the inserts that swaddle Topps, Inc.’s hard pink nuggets of corn syrup. And they’ll pop up at BazookaJoe.com, welcoming kids who’ve gone online for the games and videos that have been marketed to them. As far as the afterlife of once-beloved product mascots goes, this is some pallid, shades-in-Hades nonsense. No more will Joe and Mort trade punny zingers that bear all the blistering, in-your-face cultural currency of a Bennett Cerf joke book. Instead, they’ve been consigned to linger in the non-corporeal corporate limbo known as a product’s “online presence.” Like Mr. Peanut, the Jolly Green Giant, the Pillsbury Doughboy and other semi-retired spokesthings, Bazooka Joe and His Gang will now exist primarily as ghosts in the machine. In 1954, Topps tried again with “Bazooka Joe and his Gang,” selling individual pieces for one cent. To compensate for the wee size of the comics, Joe and his cronies were assigned easily distinguished sartorial styles—Mort’s turtleneck, for instance, and Joe’s eye-patch. Topps insists the latter was a fashion choice rather than the result of playground rough-housing gone horrifically awry. Jeff Shepherd, a collector and bubble-gum historian whose book Bazooka Joe and His Gang comes out in April, says the patch was meant to parody the hugely successful ad campaign featuring the Hathaway Shirt Man. This original gang was rounded out by the overweight Hungry Herman; Janet (later Jane), Joe’s sweetheart; and Toughie (real name: George Washington Abraham Lincoln Jones), a Dead-End Kid type who wore his white sailor hat at a rakish tilt. The characters were created by cartoonists Woody Gelman and Wesley Morse. Morse, according to Art Spiegelman’s Those Dirty Little Books, had years before authored several of the better-known pornographic comics that came to be called "Tijuana bibles." He drew two to three series per year (with each series containing 40 to 50 different gags) every year until his death in 1963, and for decades after that, Topps continually recycled Morse’s original gags, although the art was frequently touched up and simplified further. For awhile, kids were encouraged to collect and redeem the comics for various prizes—pens, keychains, charm bracelets, flashlights, cameras, and the like—but today’s devotees collect them for the sake of collecting, and speak an argot thick with serial numbers (“The release of Bazooka Joe Series 2-61,” intones one website, “marked the end of an era.”). Over the years, the cast ballooned with additions like Gloomy Gus, Boastful Billy, Silent Cy and Sam the Stutterer. In 1983, Topps creative director Len Brown, who delighted in throwing honest work at Art Spiegelman, Jay Lynch and other notable underground comics creators, asked Howard Cruse to redesign Joe and Mort as teenagers and replace the rest of the cast with new characters. Cruse, a central figure in the burgeoning, sexually explicit Gay Comix scene, obliged, introducing the wise-cracking Shades, lovesick Val, pretty Robin, and Mr. Martin, the strip’s first black character. The jokes, however, remained as dependably tame and ham-fisted as ever. In 1989, another cast shake-up attempted to make the strip more of the moment—namely with contemporary hairstyles—and at the same time, Topps introduced new themes: "Bazooka Joe Fantasies" depicted the gang’s fondest desires, such as attaining fabulous wealth or fame; "Bazooka Joe: Mystic Master of Space and Time" turned Joe into a space cop or similar adventurer; and "Bazooka Joe Raps" was exactly what it sounds like, more’s the pity (“I’m Zena! I’m hot!/And I love to shop!/Give me credit cards/And I can’t stop!”). The ‘90s brought still more new characters (grunge-rocker AJ) and gag types (“Tao of Mort,” and “Meet the Gang”). For the 50th anniversary celebration in 2003—even though the first Joe strips actually appeared in 1954—Topps re-issued 50 classic Bazooka Joe strips, including several from the original run. Collectors exulted; kids shrugged. And in 2006, what would prove to be the fatal blow was struck, as still yet another redesign introduced a raft of new characters that bloated the Bazookaverse once again. Crucially, these new gags looked very different: in a cost-cutting move, the bright, boldly colored strips were now printed in murky blue monochrome on thin, effectively transparent paper, making them difficult to read. Clearly, the (tiny, tiny) writing was on the wall. The Times piece on this latest rebranding effort paints a stark picture, citing the 48 percent drop in Bazooka sales over the years since the 2006 redesign. Topps, by deciding to retain Bazooka Joe’s presence on its website, apparently believes the fault does not lie in the character himself—despite the fact that the poor schlub’s brand awareness hovers at an anemic 7 percent in the key gum-gobbling demo of 6-to-12 year-olds. Nor does the company seem willing to entertain the possibility that the on-the-cheap print production methods they introduced in 2006 might have sent more than a few kids reaching for the Sour Blue Raspberry Hubba Bubba Bubble Tape instead. No, Topps says, it’s comics themselves—kids don’t want ‘em. That is an opinion not shared by the makers of, for example, Cracker Jack, another kid-targeted consumer product that benefits from—and suffers under—a similarly thick cloud of nostalgia. For years now, the venerable “Toy Surprise” once packaged inside each box has been replaced by tiny comics. And when the folks at Cracker Jack aren’t busy incurring the wrath of the nation’s consumer watchdogs by getting our kids hopped up on jitter-juice, they report that sales have been perfectly steady, if not slightly up, thank you very much. No matter: the makers of Bazooka are done with comics, and are confident that the way to reach today’s youth is with challenging, interactive content that’s truly on the leading edge of new thinking about value-added consumer engagement. Which is to say: with rebus puzzles. CORRECTION: An earlier version of this story misstated the year “Bazooka, the Atom-Bubble Boy!” was created.